Wir bieten mehr als 60 Filme. Technik japanischen und russischen Meister. Yasuhiro Yamashita, Katsuhiko Kashiwazaki, Hiroshi Katanishi. Filme für Trainer, Athleten und Eltern. Film 1. Exercises to technique Nage Waza - seoin-age, ippon-seoi-nage, kouchi-gari 65 min. Film 2 . Exercises to technique Nage Waza –sasae-tsurikomi-ashi, ouchi-gari,deashi-harai, okuri-ashi-harai 48 min. Film 3. Exercises to technique Nage Waza – uchi-mata 50 min. Film 4. Basics of ground fighting. Ne Waza. Movement. Changing positions of attack and defense Roll overs. 58 minutes. movement of the athlete; grip. The main focus of the seminar is how to teach the technique of judo. (Katanishi perfectly fulfills throws), but also at the show, support assignments, exercises with a belt. Also keep in mind that it is a Japanese method of teaching judo. The film will be useful for all: who loves judo, who is engaged in judo, teaching and studying judo. Delivery Russian mail anywhere in the world. Duration 4DVD - 221 min. Postal expenses Free of charge. White belt 6 Kyu 1 poster. Rei. Obi. Shisei. Shintai. Tai-sabaki. Kumi-kata. Kuzushi. Ukemi. Yellow belt 5 Kyu 3 poster. Orange belt 4 Kyu 3 poster. Green belt 3 Kyu 4 poster. Blue belt 2 Kyu 4 poster. 1 kyu brown belt 2 poster. Kallista Film Judo. Collector's Edition 12 DVD’s -706 min. Education. Methods. Practice. Video tutorial. Nage-waza. Katame-Waza.Techniques and methods of Judo by the best Japanese experts. Duratiоn 12DVD - 706 min. Katsuhiko Kashiwazaki. The Japanese method of ground fighting. Ne waza. The film 1. Osaekomi-waza. In 2009 Kashiwazaki held a seminar in Russia, St. Petersburg. The seminar is divided into several films. Here is the first part of the film. The main theme of the first film a methodology and technics of performance of Osaekomi technique. The film dealt with the following options:Yoko-shiho-gatame,Kami-shiho-gatame,Tate-shiho-gatame,Hon-kesa-gatame,Kuzure-kesa-gatame.In all variants of Osaekomi he showed how to hold grabs by hands, how to set legs, how to position the body. Kashiwazaki demonstrated basic exercises to teach children the Osaekomi technique. The film will be useful for all judo fans. For young athletes, experienced fighters, professionals and trainers. Stars of the Japanese judo Katsuhiko Kashiwazaki 8 DAN. Technique of TOMOE-NAGE throw training. 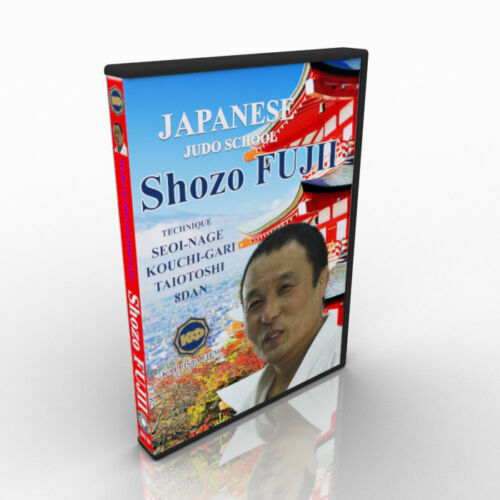 This is the first DVD of the series "Stars of the Japanese judo." Main content of this film is TOMOE-NAGE throw training.K.Kashiwazaki the best master of performing this throw not only in Japan but around the world. The first chapter is devoted entirely to this throw. In the film, you will see six variants of the throw, see methodical exercises for study tomoe-nage, and also some preparatory tasks to the trick. A separate section is a combination of action for throw: tomoenage-sasaetsurikomiashi, tomoenage-uchimata, tomoenage-Udehishigijujigatame. The second chapter is devoted to Hikikomi-gaeshi iwazaki throw. Only K.Kashiwazaki can perform this throw by this way. Unusual variant. The third chapter is devoted to OUCHI-GARI throw. This is a personal version of Kashiwazaki. Unusual for a traditional judo. Performing a throw he uses all parts of the body including the head. K.Kashiwazaki explains every detail and shows a lot. The film will be useful to all lovers of judo. Judo. Katsuhiko Kashiwazaki. Japanese method of ground fighting. Newaza. The film 2. In 2009, Kashiwazaki conducted a seminar in St. Petersburg, Russia. This is the second part of the seminar. The second film deals with several topics. This is a technique of overturns, the release of the legs. The film presented a lot of situations related to the hand grip. Kashiwazaki devoted much time to various details. He showed several exercises for teaching children. Answered the questions of seminar participants. The film will be useful for all lovers of judo. For young athletes, for experienced wrestlers, for professionals and coaches. Judo. Collection 4 DVD. Ne waza. 245 min(Disc only). Seminar on ground fighting - NE WAZA. The film of the honored Russian coach of Judo Vladimir Yelchaninov was created in Italy in 1997. The film was restored from the Yelchaninov’s archive record. Tactics in ground fighting (ne-waza). The film was shot for coaches and athletes. Yelchaninov‘s technique is closer to the Russian school. It is a technique of years of work and most importantly, easy to apply in a competitive fight. All technical actions are strictly personal and not repeated in other films. Judo for coach. Technique of ground fighting. From Alexander Jatskevich.NE WAZA. Seminar on technique - NE WAZA (Moscow 2002). 3 - Shime-waza (actions of attack and defense). Educational material is illustrated by fragments of fights of European Championship in 2002 and the World Cup 1995. Three time European champion, Olympic bronze medalist in 1980 (Moscow). Captain of the USSR in 1980 in judo. Honored Master of Sports. He worked as the head coach of of Belgium. Holds the title of the best coach_of European Judo in 2004, as well as the best coach of Belgium in all sports (after the Olympic Games in Atlanta.) Versatile man - leads training in Flemish, French, English, Estonian and Russian. Hardworking and purposeful. A good example is His sports biography. In 1970 he came for the first time to gym and in 1980 performed at the Olympic Games in Moscow. At that time to win in the USSR was akin to athletic feat. The film was shot for coaches. Ways and methods of Yatskevich’s teaching will become apparent to all athletes. On this film you can hold training sessions at the sports club or sports camp. The film is presenting only A. Yatskevich’s personal technique. In other films, this technique is not repeated. Judo. Collection 21 DVD. 1331 min. DVD-1. Katsuhiko Kashiwazaki 8 ДАН. Chapter 1-TOMOE-NAGE. In the film Kashiwazaki has shown six variants of tomoe-nage throw, has shown methodical exercises, as well as several preparatory exercises. A separate part is a combination of action for the throw: tomoenage-sasaetsurikomiashi, tomoenage-uchimata, tomoenage-Udehishigijujigatame. Chapter 3-OUCHI-GARI. This is a personal version of Kashiwazaki. Unusual for a traditional judo. Performing throw he uses every part of the body including the head. DVD-2. Tsukio KAWAHARA 8 DAN. One of the best coaches in Japan. In the film he talks about the osoto-gari, ouchi-gari, tai-otoshi throws. Chapter 1. Kosoto-gake. Chapter 2 Ippon-seoi-nage. Chapter 3. Fighting for grip. A very important subject judo. About this side of the struggle a lot of talk, but little show. Moriwaki analyzed in detail this subject. This film is designed primarily for coaches and athletes who have a good level of competitive training. Keep in mind that Yasuhiko Moriwaki demonstrates the Japanese judo school. Perhaps he is the most famous modern judo wrestler. The crown techniques: Uchi-mata, Ouchi-gari, Osoto-gari. Better than anyone (and more than anyone on statistics) in the world applied shimi-waza. From 1977 to 1985 takes the 1st place in the Championship in Japan in the weight category +95 kg. 1979/1981/1983's World Champion in the weight category +95 kg. In 1981 became the world champion in the absolute category. From 1977 to 1985 ranks first in the absolute category at the Championship of Japan. In 1981 he became the Olympic champion in Los Angeles. Although he was preparing for the Moscow Olympics in 1980. Took part in 599 competitions held 528 fights, 15 of them graduated from a draw 16 lost. In Japan did not suffer a single defeat. From 1977 to 1985 he held a series of 203 victorious fights. After completing his sports career became national coach. Chapter 2 - USHI-MATA. A detailed analysis of all technical situations. Besides he showed some important points for uchi-mata. Uchikomi and exercises to practice the throw. Combinations of this throw: OUCHIGARI-UCHIMATA. Chapter 3 - SHIMI-WAZA. In the foreword to the detailed explanation Katsuhiko Kashiwazaki said that according to statistics Yamashita is most in the world won this technique. To study this technique there is no more understandable explanation. Everything is in series and available for home viewing and studying in the gym. FUJII has interesting way of fighting that probably helped him become a four time world champion. In the film, he showed a technique to throws Seoi-nage and Kouchi-gar i, as well as several combinations with throws tomoe-nage and tai-otoshi. It should be noted that the performance of these throws is differs from other masters of judo. This film is designed primarily for coaches and athletes who have a good level of competitive training. Fuji’s fight needs to study carefully and long. One or two viewing only give an overall picture. Chapter 1 SEOI-NAGE.The way Katzuki offers to do throw seoinage in Russia is considered wrong and in this version is not taught. The whole chapter is devoted to a detailed explanation and display of this option. If you look very closely, it becomes apparent that this variant of performance is very effective. Katzuki slowly shows in detail each part of throw. To study throws seoi-nage, this demonstration in Katzuki’s explanations is very affordable and clear. If, for example, to see performance seoi-nage throw from another Japanese master Hiroshi Katanishi, there a completely different way of performing and teaching. If you work a coach, you need to explore this option it is a school Japanese judo. In 1979 Kiet Katsuki became the world champion. Chapter 2 KOSOTO-GARI.This is another side of judo. Kazuki shows in detail the situation where performance of this throw is possible and it is quite interesting. AuthorKashiwazaki. Kawahara. Moriwaki. Yamashita. Fujii. Katsuki.Pavlov. 4DVD. (221 min).Methodical exercises and tasks for Judo sportsmen. Nage Waza – seoin-age, ippon-seoi-nage, kouchi-gari, sasae-tsurikomi-ashi, ouchi-gari, deashi-harai, okuri-ashi-harai, uchi-mata.Ne Waza. Compilation is based on seminar held in Canada in 2011. Film 3. Eercises to technique Nage Waza – uchi-mata50 min. Children's judo lessons in Japan. Judo for coach - Judo in Japan. Movie 1. Training. Methods. Technique. Judo for coach - Judo in Japan. Movie 2. Hirotako Okado. Judo for coach - Judo in Japan. Movie 3. Koji Komata. Judo - Olympic «IPPON».Sydney 2000.Movie 1. Judo - Olympic «IPPON». Sydney 2000. Movie 2. XI Moscow international judo tournament «Super-A». My Judo - Ippon Super A.
Judo for coach.Technique of ground fighting. From Vladimir Elchaninova.NE WAZA. Judo for coach.Vladimir Elchaninov.Technique of throwing in position.NAGE WAZA. Judo for coach.Technique of fighting in position. From Alexander Jatskevich.NAGE WAZA. Judo for coach.Technique of ground fighting.From Alexander Jatskevich.NE WAZA. · Production Kallista Film. Russia. · Delivery Russian mail anywhere in the world. · Duration 12DVD - 750 min. · Delivery time 2-3 weeks. · Postal expenses Free of charge. Sambo of Russia.Lessons of sambo. 6DVD. (412min).Collection of training films. Sambo ("self-defense without weapons") - the national Russian struggle. It is a complex self-defense system developed in the USSR. The official date of birth of Sambo is considered to be November 16, 1938, when this kind of sport was recognized in the USSR. Sambo is one of the young, but quite popular kinds of sports. Due to its technical operations this fight is much like judo. Experts consider this fight a combination of many national wrestling styles in clothing, not only Russia, but also from other nations. This sport has a huge arsenal of techniques of defense and attack, which number about five thousand. Sambo wrestlers are often involved in judo competitions and achieve good results in the international arena. In Russia, often in the same room are trained sambo and judo fighters. This is because the rules of Sambo allowes to attack in lying longer. therefore a lot of training time is devoted to painful holds. Russian Sambo idol is David Rudman, who became famous by virtuoso lying wrestling and mastery in the performance of painful holds. Seminars under his supervision you will find on our site. DVD1. Sambo. Kytmanov. Theory and practice of ground fighting. Kytmanov Alexander is a silver and bronze medalist of the World Sambo, silver and bronze medalist of the European Sambo. Silver medalist at the European Judo. This is very interesting and inventive sportsman. The entire seminar, technique is nonstandard and for many athletes and coaches will be unexpected. The film consists of two parts and focuses only on ground fighting, defense and attacks actions. The film also has chapters on methodological exercises and tasks, where he tells and shows special exercises. Total he touches 16 different themes on ground fighting. DVD2. "Russian Sambo" - "Michael Martynov. My personal technique. " World Champion - 2001. The second place at the World Championships 1998, 2000. European champion 1999. Of course, it's not all his sports achievements. In the film, you will see his personal technique. The film is full of content, rich with examples and technical operations. Film consists of three parts. The first part contents: stance, grip, movement. The second contents throws and the third – painful hold. There is very necessary content in the film for athletes and coaches - it is a wrestling to grip and hold breaking. That is all the world-class technique. DVD3. "Russian Sambo" - "Michael Martynov. competition Technique. " Mikhail Martynov. Technique of Sambo at competitions. In the first film you saw a detailed story and the demonstration of techniques of Sambo in the gym but in this film you will see the technique performed in the difficult conditions of the competition. This film illustrates the diversity of Sambo wrestling. Watching movies, you will certainly notice the varied fighting style of M.Martynov. For beginners and professionals Sambo wrestlers this is a good video tutorial. There are six parts in the movie. • Chapter 1 - 14 different techniques. • Chapter 2 - 24 different techniques. • Chapter 3 - 15 different techniques. • Chapter 4 - 13 different techniques. • Chapter 5 - 12 different techniques. • Chapter 6 - 11 different techniques. The film contains 89 the highlights of wrestling from the personal M. Martynov’s archive. DVD4. Lessons of combat Sambo. David Rudman. "1000 ways of painful hold." David Rudman famous and legendary figure of the Soviet and Russian Sambo. He is a former international sportsman and now a coach with a huge sports and coaching experience. Honored Master of Sports, Honored Coach of the USSR. Author of a number of books on sambo. The founder of the school "Sambo 70". The president of the Sambo International Federation (FIAS). Holds the title of academician of the Academy of Security, Defense and Law-and order of the Russian Federation. In 2009, on the FIAS Congress elected Honorary President and First Vice-President of FIAS, awarded the title of Master of Martial Arts in Russia.December 8, 2012 DL Rudman conducted a seminar on "Principles of painful holds." No wonder the film has a subtitle "Sambo lessons - the theory and practice of painful hold." By viewing this film, you get a complete idea of how to do painful hold, the principles on which it is based, how to teach children the painful hold and what to explain during its demonstration. David Lvovich gave a detailed explanation of each option. The film is a mini tutorial on the basics of painful hold. This is the beginning, which is necessary in training. Based on of this film you can conduct educational training sessions or write a lesson plans. Also in the film are video examples of the rules related to Sambo painful holds. Part 1 – Principles of the painful arm lock. Part 2 - Principles of the painful leg lock. DVD5. Lessons of Sambo. David Rudman. Decoupling of hands during painful hold armbar. This film is a continuation of the theme of "1000 ways to perform the painful hold." This is the second seminar devoted to interesting subject "Decoupling hands during painful hold armbar." There is a four chapters in the movie.This is the second video tutorial on ground fighting. This seminar was run for the coaches but it is also good for an athletes. Based on this film you can run classes and plan training. DVD 6.Sambo for coach - 100 submission techniques of SAMBO. The film uses fragments of the fights of World Championship 2009, the championship of Russia 2009 World Cup Memorial A.Harlampiev 2008-2009. Film 1. Painful arm lock. Film 2. Painful leg lock. The world's only film, which contains moments of the struggle for a painful holds. There are 50 variants of painful arm locks and 50 options of painful leg locks. Autor M.Martynov, A.Kytmanov, D. Rudman, D.Pavlov. The 59th Russian championship of the Sambo wrestling. DVD 1. The final meetings in weight categories 52,57,62,68,74,82,90,100, +100 kg. In the first film, you will see the final meetings of the best fighters of Russian Sambo of 2009. Almost all of these fighters are champions of the world and Europe. In the film, you will see the best fighters of the World Sambo. DVD 2. 100 best technical actions of the 59th Russian Championship. In the second film, you will see the top 100 throws of this championship. Many throws are just as beautiful as in judo. Direction The 59th Russian championship of the Sambo wrestling. Attestation requirements for Assigned qualifying degrees "Kyū". This collection includes 120 technical actions of judo. This video tutorial that allows you to take exams, learn technique nage-waza and ne-waza. . Besides simple technical action here presented combination of action. Each technique has international terminology and Russian translation. Each belt corresponds to the level of preparation of athletes. For each degree "Kyu" there is the primary and secondary material. Collected technical actions on 2 DVD's can serve as the basis for writing plans to train. The film will be useful for athletes and coaches and also it is an excellent handbook for schools and sports clubs, developing judo. DVD 1 - 65 min. 6 kyu - White Belt - 8 technical actions. 5 kyu - yellow belt -18 technical actions. 4 kyu - orange belt - 21 technical actions. DVD 2 - 77 min. 3 kyu - green belt - 28 technical actions. 2 kyu - blue belt - 28 technical actions. 1 kyu - brown belt - 21 technical actions. Basic standards of judo technique for assigning student's degree of "Kyu". Duration 2DVD - 142 min. Posters Judo -KU. Set of 18 pieces. Russian school of judo. Ne waza. Nage waza. 225 min. Seminar on fighting techniques in standing position NAGE - WAZA. The film of the honored Russian coach of Judo Vladimir Yelchaninov was created in Italy in 1997. The film was restored from the Yelchaninov’s archive record. Principles of Learning grips; capture options; standing positions; tactical preparation of throw; variants of throws. Judo technique of Yelchaninov’s demonstration is really unusual and interesting at the same time, but most importantly it is practical. Evidence of that is his pupil Boqiev Rasul (Tajikistan). In 2008 he becomes 3rd World Champion and 3rd winner of Olympic Games in Beijing, and in 2009 won the championship of Russia. Here you will see a totally different world-class judo. Seminar on fighting techniques NAGE WAZA-(Moscow 2002). 5 - deceptive and counterattacking actions. The film was shot for coaches and athletes. There is an interesting section "protection from the Georgian struggle." There is no such a detailed analysis in any another the film. Still most athletes in the world use these options. All technique actions are personal technique of A. Yatskevich and does not intersect with other movies. DVD-1. Katsuhiko Kashiwazaki 8 DAN. Chapter 3. Fighting for grip. Chapter 1 SEOI-NAGE. The way Katzuki offers to do throw seoinage in Russia is considered wrong and in this version is not taught. The whole chapter is devoted to a detailed explanation and display of this option. If you look very closely, it becomes apparent that this variant of performance is very effective. Katzuki slowly shows in detail each part of throw. To study throws seoi-nage, this demonstration in Katzuki’s explanations is very affordable and clear. If, for example, to see performance seoi-nage throw from another Japanese master Hiroshi Katanishi, there a completely different way of performing and teaching. If you work a coach, you need to explore this option it is a school Japanese judo. In 1979 Kiet Katsuki became the world champion. Author Kashiwazaki. Pavlov.Kawahara. Moriwaki. Yamashita. Fujii. Katsuki. Judo for coach - Judo in Japan. Movie 1+2+3. Training. Methods. Technique. Uchikomi: seoi-nage, osoto-gari, o-ugi-gari, uchi-mata, ippon-seoi-nage.Shime-waza,Kansetsu-waza.Tai-otoshi, uhi-mata, osoto-gari, seoi-nage. Records of workout in Japan. Chapter 1. Warming. Exercise «uchikomi» to seoi-nage, osoto-gari, o-ugi-gari, uchi-mata, ippon-seoi-nage techniques. Chapter 2. Technique Shime-waza, Kansetsu-waza. Special methodological exercise. Chapter 3. Throwing technique tai-otoshi, uhi-mata, osoto-gari, seoi-nage. Unusual and not standard film. This is a look at the training of Japanese athletes in their gym. Here you can see how they train, what they do, how much, how fast and much more. Feature of this film is a system of exercises «uchikomi». There is no special staged scenes only real trainings. 1DVD. (60min).Teaching the techniques of judo in Japan. O-soto-gari, Ko-uchi-gari, O-uchi-gari, Okuri-ashi-harai, Deashi-harai. Detailed analysis of technique of judo. Techniques: O-soto-gari, Ko-uchi-gari, O-uchi-gari, Okuri-ashi-harai, Deashi-harai. Classes are conducted by Hirotaka Okada, two time world champion and 3 medalist at the Olympic Games in Barcelona in 1992. Here you will see a purely Japanese technique. Chapter 1.Technique ASHI-WAZA. Deashi-harai, Sasae-tsurikomi-ashi, Ouchi-gari. Koji Komati once coached the national team of Japan. That says a lot. The entire film, he constantly shows and explains. A lot of interesting things for the coach and athlete. Techniques in his performance and explanation are interesting and easy to learn. Those who have not seen the Japanese judo school will largely surprised. Perfect methodical video tutorial. Collection of lessons, tasks, and exercises for teaching children from 4 years. 1.Training with a rubber expander. Exercises. Tasks. 2. Judo lessons. Learning the tai-otoshi throw. 3. Lessons of children's judo. Training. Standing position. Grab. Movement. 4. Lessons of children's judo. Technique of interception of a grab. 5. Seminar for the coach. Methods of teaching children to make grabs. Duration 5DVD - 249 min. Judo.Tsukio KAWAHARA 8 DAN.Stars of the Japanese judo The international seminar. One of the best Japan's coaches. He specializes in throws Osoto-gari, Ouchi-gari, Tai-otoshi. • How to perform a the throw, if the opponent is bent. If you look closely, you can see how to use your shoulders during throw. • How place "throwing" leg. • What do the hands do during the throw. You should watch the film several times and carefully. Subtleties of throws shown by Kawahara are interesting and useful in teaching judo. In the film, you will see the detailed, even in some moments, meticulous explanation. Everything is laid out on shelves and has a certain sequence. The film shows good details of technique. Judo. Stars of the Japanese judo The international seminar. Shozo FUJII 8DAN. Yasuhiro Yamashita. Stars of the japanese judo. • Lesson 1. How to take the "expander". First assignment. Initial mistakes. • Lesson 2. Exercises to the seoi-nage and tai-otoshi methods. • Lesson 3. Exercises to the tomoe-nage, sasae-tsurikomi-ashi,kouchi-gari. • Lesson 4. Exercises with expanders in one hand. • Lesson 5. Exercises to the seoi-otoshi, kata-guruma, soto-makikomi. • Lesson 6. Dress Up the expander to a partner. • Lesson 7. Dress Up the expander itself. • Lesson 8. Working with "expanders" in the movement. Besides the above techniques in the film you will see the exercises to tai-otoshi, osoto-gari, ippon-seoi-nage, ura-nage, o-goshi, kosoto-gake. Total 60 exercises, on which you can create new tasks. The main theme of the film is to show the possibilities and variety of exercises with expanders. In the film, you can find tips for the initial training with the "expanders". You can find exercises for one, two or more sportsmen. The second film is about training in different parts of the world. You'll see how athletes and coaches around the world use "expander" in training. For example in Japan, England, Portugal, Italy, Russia. Duration 2DVD - 91 min. Children's judo lessons in Japan.Kodokan. Film 1. Institute of Kodokan. Callista film offers a new series of films about children judo in Japan. Contents of the proposed films a teaching and training sessions in Japanese schools, clubs and centers for the study of judo. . This film tells about training of children in the Institute of Kodokan. The film consists of two parts. In the first part training takes place with children from 5 to 12 years in the big hall of the Kodokan (420 tatami). The second part for children from 12 to 15 years. . This is live video training. In the film, a lot of different exercises and activities. In the film, a lot of interesting things for the coach and for his students. The film will be useful for all fans judo. This movie is a training tool on TAI-OTOSHI throw. The film is divided into 13 stages. The main theme of the film is how to teach children the tai-otoshi throw. Step 1. Legs statement for the throw. The first mistakes. Stage 2. The first movements (exercises for the legs). Step 3. Forming the pose of the throw. Stage 4. Entering to the method (mistakes in the legs positioning). Step 5. Exercises for the throw preparation. Step 6. Taking the first grip (exercise with one grip). Step 7. Taking two grips (uchikomi for the tai-otoshi technique). Step 8. Performing the throw (how to throw, how to work with your hands, where to turn your body). Step 9. Removing from the balance (special exercise). Step 10. "throwing by" (special exercise for wrestlers). Step 11. "throwing by" with the fall (why and how to perform a throw with a fall). Step 12. Tai-otoshi in the movement (exercise for the competitions). Step 13. Additional tasks with a rubber expanders. It is important to note that all tasks and exercises related to the constant movement of one or two fighters. In the film collected examples from international competitions, World Championships and Olympic Games. The film is intended for children from 10 years, as well as coaches and fans of judo.